Boat is located in Charleston,SC.Please contact the owner @ 843-640-three three two eight..If boating is your passion the Sunesta 264 is your boat that can tackle offshore conditions, yet remains carefree on lakes and rivers with a self-bailing cockpit and a molded drainage system to take your cares away. A Yacht-Certified passenger capacity means unlimited fun for everyone with no designated passener and/or weight limits. This boat has it all if you want fun in the sun or shade. It has a wide open layout that allows plenty of room to move about and provides comfortable seating for all. The boat is powered by a Volvo Penta 5.7L gasoline engine providing 300 hp with the smooth shifting Duo-Prop drive. This sets her on plane gracefully and is super easy to manuever. This boat was used in fresh water for the first seven years and then used in salt water where it was racked stored with the engine flushed with fresh water and the outside washed down after each use. There is no trailer for this boat as it is racked stored. Boat has a large swim platform, snap out carpet, full length Sunbrella snap on cover, stereo with six speakers (satellite enabled), dual battery switches, battery charger, cockpit electric grill, large power inverter, private enclosed porta-pottie, table, docking lights, new Garmin GPS system, fresh water tank with three shower heads, and Sunbrella Bimini top. 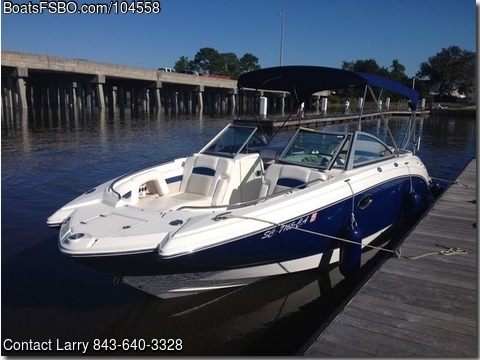 This boat has been professionally maintained annually by certified marine mechanics. It is in great condition with a few scratches in the hull from docking.